You are here: Home / Personal Development / Good Guys vs Bad Guys: Personal Development Beyond the Illusion! 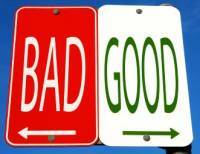 Good Guys vs Bad Guys: Personal Development Beyond the Illusion! It’s hard to watch the news or look around ourselves without seeing so much strife. Outrageous acts against humanity seem commonplace, and it can be hard to digest. This strife can strike our own lives as well. The sting of hurt feels even worse it is delivered by the hands of people you trust and love. We have likely all experienced this sort of betrayal at work, in our home, or in our relationships. It’s incredibly difficult and painful! When trust is broken, it feels as if the good guys have turned bad. We wonder if they’ve been this way all along. When the “dark side” or “underbelly’ side of someone is exposed, are these their “true colors” that shine through? Are we actually seeing who and what they really are, for the very first time? It can be a natural reaction to want to classify people, groups, or even entire countries in one category or another. Almost instantly, we decide if a person is trustworthy, good, or bad. We can view situations and people as black or white, perhaps believing that these categories and divisions will create order and safety, and reduce our chances of being hurt. But does viewing those around us in such strict categories help or hinder our personal development? If you look to your own life, there is likely something or somebody that you have a strong adverse reaction to. You may fundamentally disagree with their values, their choices, or their actions. They may go against every fiber of what you believe in or what you stand for. Is it this opposition then, that results in the “bad guy” branding? Look deeper. If in your mind someone else is the bad guy, and you are in opposition of them, does that somehow position you to be the “Good Guy”? Human nature is a funny thing – don’t you think? In our profession of personal deveopment, we work with everyday people with everyday problems. How to unravel hurt and reistablish trust is a common dilemma for most people. I find that recommending movies can afford us a powerful window into someone else’s experience or story that we can often relate to. Your James Bond assignment (should you choose to accept it) is to first watch the amazing movie “Crash” starring Sandra Bullock, Matt Damon. (Youtube trailer attached – (https://youtu.be/durNwe9pL0E ). When finished, make two lists of the movie characters. One list will indicate the good guys and the other is for the bad guys in the film. The next personal development step is for you to sit down and make your own list of who you think the bad guys are in your own life. This list will remain private, so there’s no need to hold back. This could be people you are aware of, but don’t personally know (e.g. politicians). It could include people at work or in your community. It could people who were at one time very close and dear to you. This list usually spans time, calling on both your past and present life. What you may find as a common thread between these people is the sense of pain or even a distrust that you may experience when thinking of them. Consider the movie, especially the areas of grey within the characters’ lives that shape their reactions and experiences, and then allow yourself to truly ponder. Do you know who that other person is? Do you know who you are? What is it that separates the good and bad guys and is there a price to pay for that separation? When people and issues collide, what do you do with the hurt of betrayal and how do you actually learn to trust again? Well my friends, that is the 10 million dollar question, with an answer to be unveiled soon. Once you have completed this assignment, we encourage you to join us on the Global Alignment’s Facebook page to post and share your views of all that is challenging and wonderful about uncovering this very real dilemma. We can all grow together.